HDR Web Designs has created websites for businesses in a variety of fields including, restaurants, auto mechanics, real estate agents, and therapists. Skiyou Ranch is a fourth generation, small family farm located in beautiful Skagit Valley, nestled along the Skagit River. The owners of the Skiyou Ranch have an expanding business and needed a website to help represent their products. 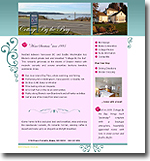 Cottage By the Bay is a bed and breakfast located in Blaine Washington. This website was built from the ground up. The owner needed a Internet presence to supplement their word of mouth advertising which has kept the business stable since 1985. The color scheme was selected by the website owner to reflect the feminine touch of this B&B. New York Pizza and Bar was looking for a basic restaurant website and needed a new website built from scratch. They already had the logo, but needed a direction for their web presence. HDR Web Designs came up with the concept of a brick background and blackboard style menus. The iron bar across the header for the menu navigation seemed like a great fit. RyanMartinRealEstate.com was originally created in 2003. This website has been renovated many times and underwent the most recent renovation in 2008. RyanMartinRealEstate.com is one of the leading real estate websites in Bellingham. The inventory is displayed via deep linking frames on uniquely optimized pages. This website also features a fully integrated Wordpress blog. Master Auto Tech LLC is a clean and professional auto repair business that wanted their website to reflect how they do business. Bob, the owner, has a passion for auto repair and wanted an internal business blog integrated into his website, so he could showcase his knowledge and passion. John Templeton is a real estate agent with Windermere who specializes in luxury properties. John wanted his website to be easy for his clients to use while still maintaining a classy clean style. Victoria McGuiness is a local child parent play therapist that needed a website built from scratch. Play by the Bay had a logo and a concept and let HDR Web Designs Run with it. We choose to go with a fun and bright colored design.